DUBAI, United Arab Emirates (AP) — She is largely unknown in the United States. But the American anchorwoman for Iran’s state-run broadcaster, detained last weekend by U.S. authorities, is a familiar face on its English-language channel. 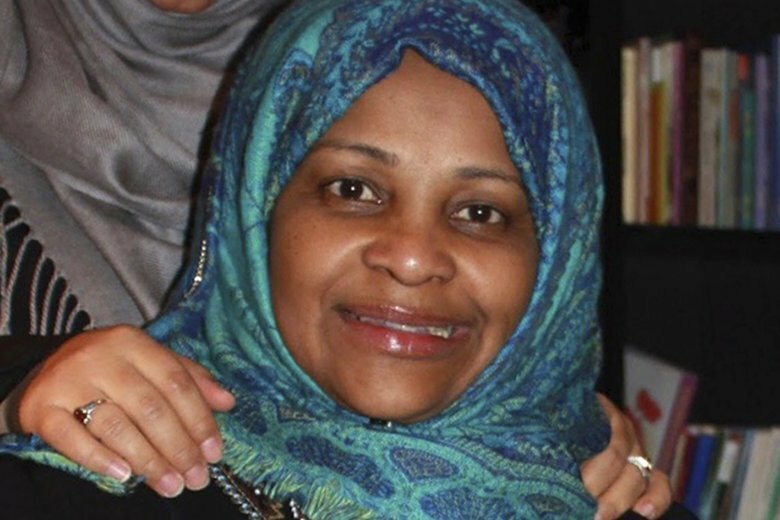 As a newscaster for Press TV, Marzieh Hashemi has been conducting interviews and reading the news as written by government loyalists in the Islamic Republic. It’s a long way from New Orleans, where she was born Melanie Franklin in 1959 to a Christian family. In college in Louisiana, encounters with Iranian students in the wake of Iran’s 1979 Islamic Revolution saw her convert to Islam. A marriage brought her to Iran, where she learned fluent Farsi and began working for the country’s state broadcaster 25 years ago. Her journalism and her public comments mirror her host country’s official ideology. Now, after her apparent arrest by the FBI, her family is questioning why the 59-year-old grandmother was imprisoned by the U.S. Her detention comes at a time of escalating U.S.-Iran tensions, including President Donald Trump’s maximalist approach to Iran after pulling America out of its nuclear deal. Hashemi was detained Sunday in St. Louis, where she had filmed a Black Lives Matter documentary after visiting relatives in the New Orleans area. She was then taken to Washington by the FBI on a material witness warrant, according to her elder son, Hossein Hashemi. The FBI said in an email that it had no comment. Federal law allows judges to order witnesses to be arrested and detained if the government can prove their testimony has extraordinary value for a criminal case and that they would be a flight risk and unlikely to respond to a subpoena. The statute generally requires those witnesses to be promptly released once they are deposed. Hashemi studied journalism at Louisiana State University in Baton Rouge. A yearbook photo shows her smiling with other colleagues at WPRG, now KLSU, the student-run radio station. “When we were in school together, that was during the Iran hostage crisis. LSU had a sizeable number of Iranian students who were going to school there,” said radio newsman Jim Engster of Baton Rouge, who was also in the photograph. Hashemi said that’s where she learned about Iran’s revolution, which saw Shah Mohammad Reza Pahlavi replaced by an Islamic Republic led by Ayatollah Ruhollah Khomeini, a Shiite cleric who had final say on state matters as the country’s supreme leader. Hashemi ended up in Iran working at Iran’s state broadcaster, the Islamic Republic of Iran Broadcasting, or IRIB. There are no private television or radio stations in Iran. Satellite dishes, while widespread, also are illegal. That leaves IRIB with a monopoly on domestic airwaves. Since the revolution, IRIB has been in the hands of hard-liners who back Iran’s government. Their broadcasts mirror those of other state-run channels across the Mideast, with direct criticism of leaders incredibly rare. Press TV, launched in June 2007, is IRIB’s English-language service. While airing in Iran, it focuses predominantly on international affairs through the lens of how leaders in the Islamic Republic see the world. The hashtag “FreePalestine” accompanies stories on the conflict between Israelis and Palestinians. Fierce criticism of British and American foreign policy is common. Its broadcasts have drawn Western criticism. The channel was pulled from the air in Britain in 2011 after a complaint by Maziar Bahari, a Canadian-Iranian journalist for Newsweek who was imprisoned by Iran after the 2009 disputed re-election of hard-line President Mahmoud Ahmadinejad became the Green Movement protests. Bahari said the channel aired an interview that had been scripted by his captors, who threatened to execute him unless he cooperated. For her part, Hashemi both helmed newscasts critical of the West and offered her own criticisms as well. In 2009, she said she believed Western media exaggerated popular support in Iran for Mir Hossein Mousavi, a reformist who was later put under house arrest, where he has languished for years after challenging Ahmadinejad in 2009 and leading the Green Movement protests. It remains unclear why Hashemi was arrested. However, it isn’t the first time she’s been questioned by U.S. authorities, her son said. Associated Press writers Janet McConnaughey in New Orleans and Michael Balsamo and Monika Mathur in Washington contributed to this report.